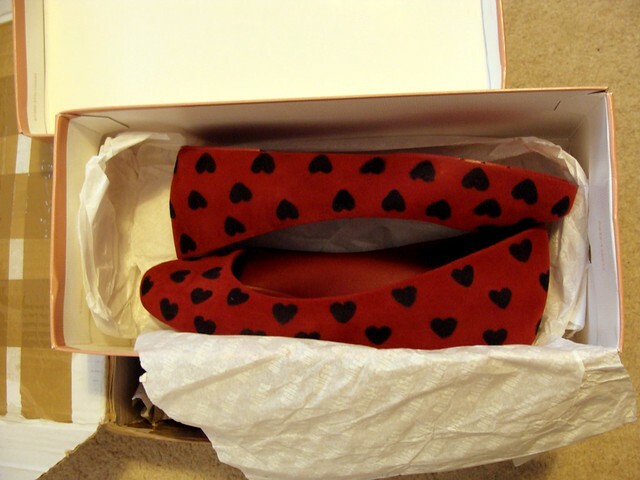 Over the last couple of weeks I’ve had a few things come through the post: a pair of Melissas and my Christmas blogger swap present! I have taken a few photos that I don’t think do justice to what I have received but heigh ho, even the natural light is dim this time of the year. The first parcel I received was sent by my friend Roger, who picked this lovely pair of Melissas in Brazil, on a trip to see his family. As Brazil is this brand’s country of origin, it was only fitting that I would have to ask for a pair of them. I obviously loved them, as they’re so pretty with all the hearts and the bubblegum scent. They’re also very comfy and I’ve already worn them out to the office once. Thank you Roger, I will wear them thin! Mr Postman paid me another visit yesterday and the second present I received was the parcel Rosemary of Forever in the Catwalk of Life has sent me as part of the blogger Christmas swap organized by Sacramento of Mis Papelicos. Basically we had to put together a package containing 3 items: 1 handmade, 1 Christmas related and 1 thrifted. 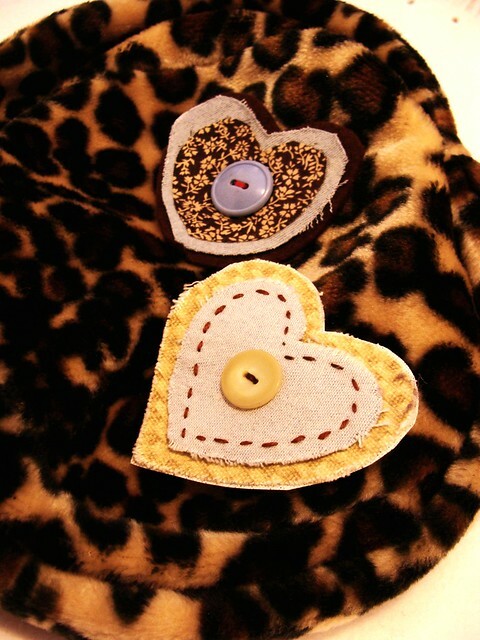 A comfy leopard hat (I can’t wait to wear it outside) and two handmade heart shaped brooches. 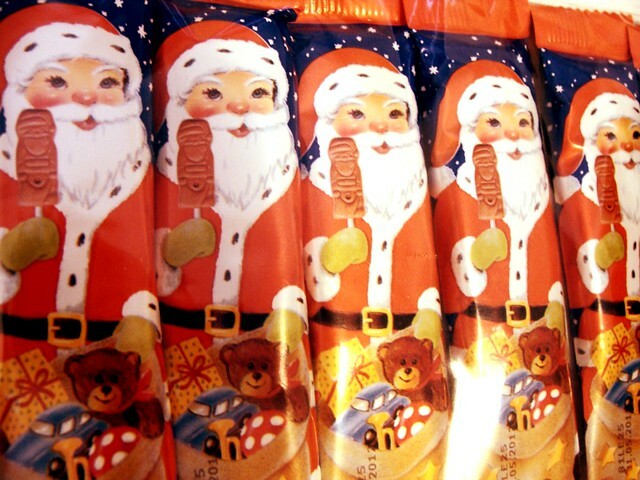 Chocolates with rosy cheeks Santas. Yum yum! Many thanks to Rosemary for the lovely items and to Sacramento for organizing the blogger swap, it’s been good fun! 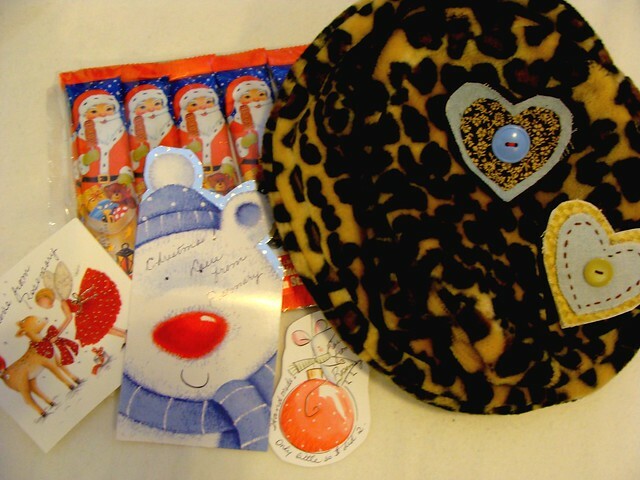 .you are the first to receive a parcel from the swap, how fantastic. 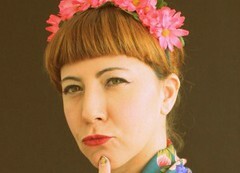 Shall I keep one of the pics for the SWAP Christmas card??? Yes, they are lovely 🙂 My friend has good taste and he chose well.